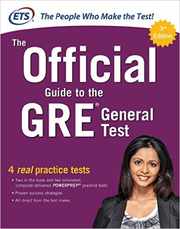 The Official Guide to the GRE Revised General Test is the primary source of revised GRE® questions and information published by ETS, the administrators of the GRE®, and is an essential resource for test-takers of all ability levels. This guide features verbal and quantitative questions that closely match the type of problems you will encounter on test day, as well as explanations of the new testing format. Sample essay topics are also included. Students who want in-depth GRE prep as well as a thorough understanding of the revised testing format. This guide covers all concepts tested on the revised GRE.